After class on Thursday, I decided to stop by the local Target near my school. I wanted to check out if they had any E.L.F. products since they usually don't every time I stop by. Lucky for me, this time they did! But, the only things on display from E.L.F. were the new holiday sets. There were lots of cute stuff, like lip gloss sets, eyeshadow sets, eyeliner sets, and the sort. But to tell you all the truth, all but one set did not really stand out to me. I only picked up one set from E.L.F. 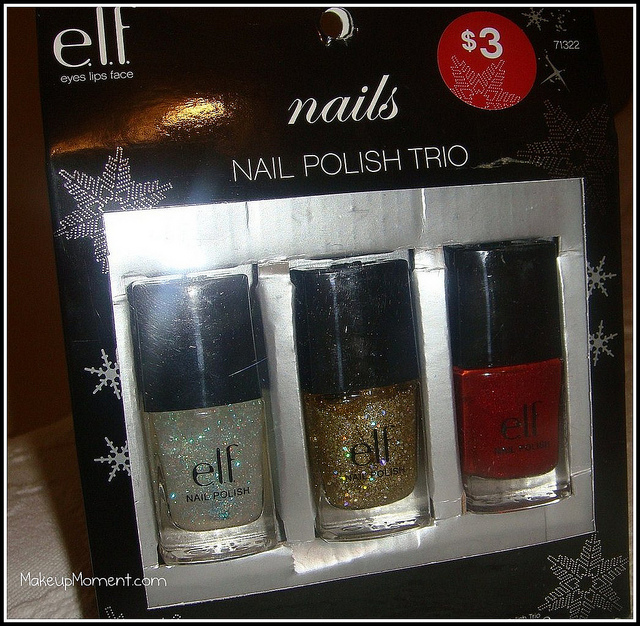 and it was the Nail Polish trio ($3.00). I checked out the E.L.F. 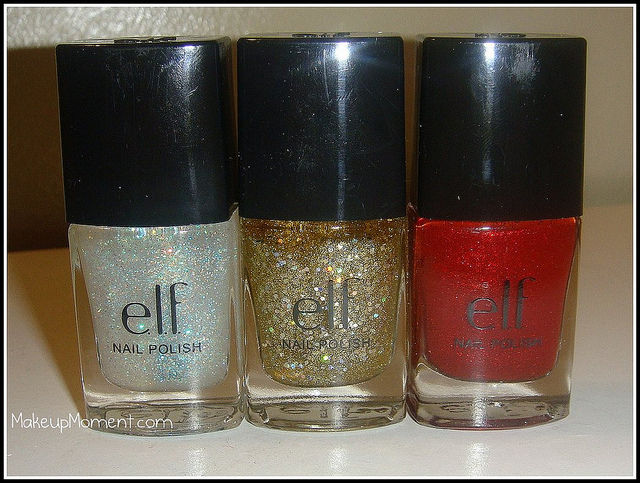 Website and I did not spot this set of three festive holiday polishes. But each of the three colors are available individually for $1.00 each (click here to check them out), or you can find them at your local Target and the Target website HERE. Twinkle is a pretty clear based glitter polish. The glitter contains sparkles of aqua and orange by what I can make of it. 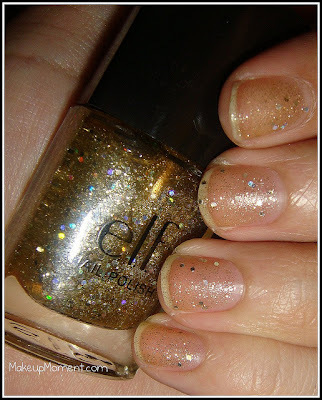 The glitters are very fine and they do not feel rough or gritty on the nails once applied. This polish dries matte, and I think it would look best layered over another one but I would suggest applying 3-4 coats to get a semi-opaque glitter. 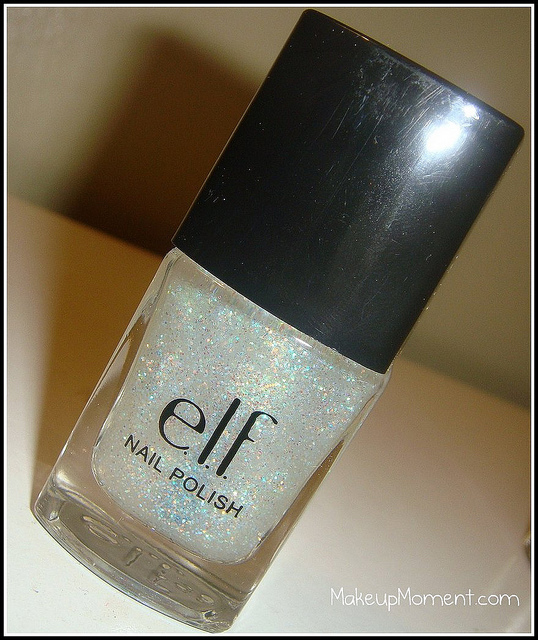 I am sure this glitter would add a nice hint of sparkle to the polish you apply it over to. But to me, it's not a WOW! glitter polish. I am sure there are much better, and more opaque glitters out there. Golden Goddess is another clear based shimmer/glitter that contains holographic? gold glitter. You see sparkles of green, red, purple, and gold. This one is really interesting to me because you get a whole lot of pretty colors. Along with the gold shimmers in the polish, you also get some chunky glitter to add on top of that as well. Can we say fun in a bottle? The glitters don't feel gritty and rough on the nails. Also, when worn alone I see this leaves behind sort of a golden/yellow cast on the nails and this dries to a matte finish. I bet this one would look gorgeous layered over a red or a green polish! 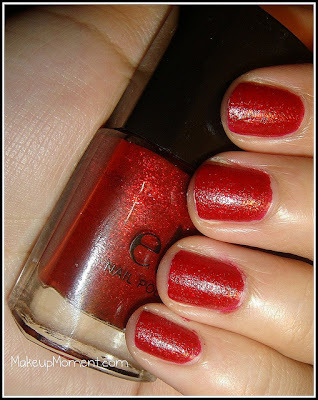 Cranberry is a gorgeous cherry red shimmer. 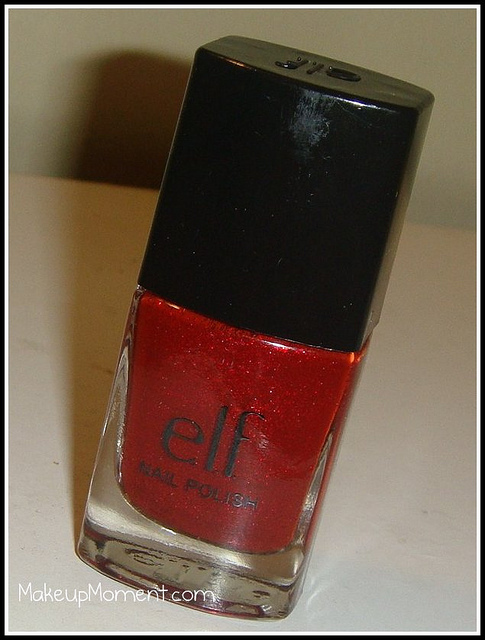 You may not be able to tell by the picture, but in person the bottle shows that this red contains lots of red based shimmers. But I was a bit underwhelmed with Cranberry once I applied it on my nails. By the way, this color is a bit sheer at just one coat. I suggest doing 2-3 coats of this one. 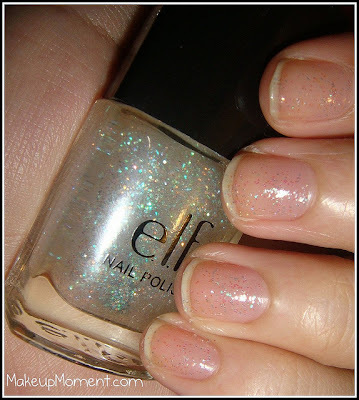 Once I got it on my nails I felt as if all the shimmer was drowned in the polish. 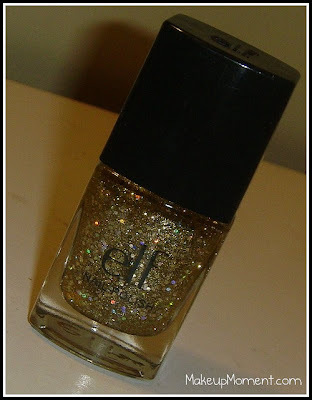 Maybe this was because the shimmers were the same color as the base of the polish? I don't know, but I am not too crazy about this color. It seems a bit dull to me. Nothing special about it. A clear top coat is definitely needed with cranberry if you want to add some shine to the color as this color also dries matte like the other two. Overall, I think this nail polish trio set from E.L.F. is pretty cute. Great for the holidays and I am sure I will have loads of fun layering the glitters over other nail colors. When I do, I will be sure to post them here. I am happy to report that drying time on all of these was really fast. Application-wise, They all dry to a matte finish, and I found that they were all very easy to apply even though I was not too fond of the flimsy nail brush. But for the $3.00 price, I can overlook that teeny factor. Also, the formula on these was kind of watery/runny. But it did not really bother me much. Have any of you spotted this kit yet or any other E.L.F. holiday sets at your local Target? Have this set? What do you all think of it? Let me know in the comments section! Disclaimer: I am not affiliated with any of the companies mentioned above. I purchased this with my own money. So pretty! How long do they last on your nails? These look great, I think Cranberry would look better with one of the glitters on top--festive!